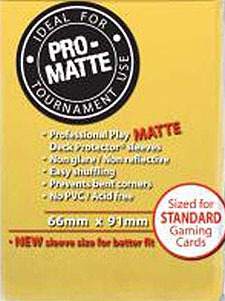 50 66mm x 91mm card sleeves. I picked a pack of these up recently to sleeve the yellow cards in my copy of Splendor (please see my review of this awesome game...) and I am glad I made the switch to the Pro-Matte sleeves. The quality is very good, and seems better than the Mayfair Premium sleeves I had been using to date. I love the colour and in particular the fit, they seem to fit very well and don't trap air as easily. Also they shuffle a LOT better than the Mayfair Premiums which are too glossy and slippy. These sleeves are attractive, great quality, an at a good price point compared to Dragon Shield sleeves.